great looking husky dog! shes a beauty. but i dont understand the 6x6 4wd heres my ol dog being harassed by my edgerunners. It looks like the 4wd chassis. 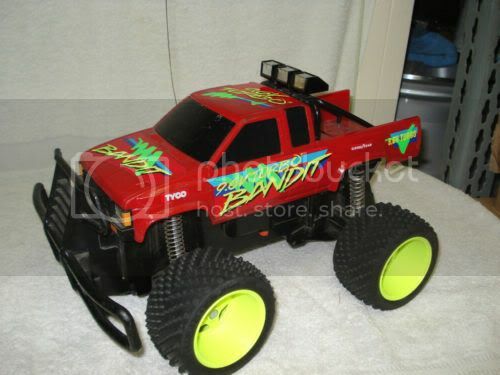 I don't think the blaster body was ever on the 4wd chassis from the factory. it does doesnt it?,,the blaster normally sits higher up in the back,and the blasters tires are smaller in the front like most 9.6v 2wd hoppers unlike the one in the vid,,he prob took the drive shafts out and just put the blaster body on it. Read the description, you'll know what I mean. Anyway, it was posted as Buy Now for $999.99 until people started bidding at $99.99 I would not touch that thing for that amount knowing that it has cracks and broken parts. Possibly a stripped H/L gear too. In his description he goes on about "The Kid Down the Street," I wonder if he's referring to himself? "I poisoned my dog so he can't keep chasin' that baby giraffe." thats right, it looks like the chassis for the super turbo hopper i once had. it was black/blue/yellow. it had the black shock towers and yellow shocks on it. now that i think about it, i also once had a red super turbo hopper that it may be from. i cant recall now. but definitely a 4wd chassis. and oh yeah, that guys description of his fast traxx is just dripping with douchebaggery. i wouldnt give him a nickel. thanks stussels ,,,maaaaaan i bout fell out when i read that fast traxx description lmao! !